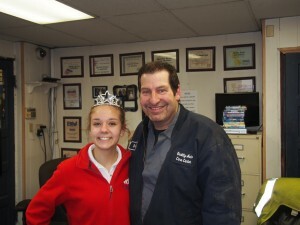 On February 13, 2015 I met with my sponsor Bruce Bairaktaris from Quality Auto Care Center in South Saint Paul. I had so much fun! We talked about everything from my driving skills to my classes I am taking in school next year. I learned that his daughter is in 9th grade and is already taking college courses at the U of M. While taking one of the pictures of me holding the car, my dad Scott told me to not stand right under the car or else it would drip on me and then I looked up and it dripped on my face we all laughed at how ironic and funny the situation was. 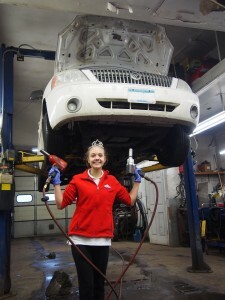 I am so glad to have Quality Auto Care Center as my sponsor.